Dear Readers, we are presenting Marketing Quiz for IBPS Specialist Officer Exam.We will provide various sets of marketing questions. 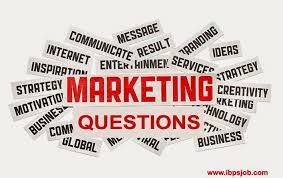 Try to solve these Marketing questions. If any doubt ask in comment section. We will provide more questions in upcoming posts. 4) new methods for increasing prospects. 1) distributing a mix of products. 2) collecting ideas to sell better. 4) bundle of products required by the customer. 5) various products designed by the company. 1) result of operations for a particular period. 2) the financial position as on a particular date. 3) the operating efficiency of the firm. 4) financial position during a particular period. 3) exports are heavy and costly. 4) salesmen are effectively trained. 5) All the above situations.